You can create live data connections to on-premise and cloud systems. Data is “live”, meaning that when a user opens a story in SAP Analytics Cloud, changes made to the data in the source system are reflected immediately. In SAP Analytics Cloud, you can create models from data sources in on-premise or cloud systems, build stories based on those models, and perform online analysis without data replication. This feature allows SAP Analytics Cloud to be used in scenarios where data cannot be moved into the cloud for security or privacy reasons, or your data already exists on a different cloud system. 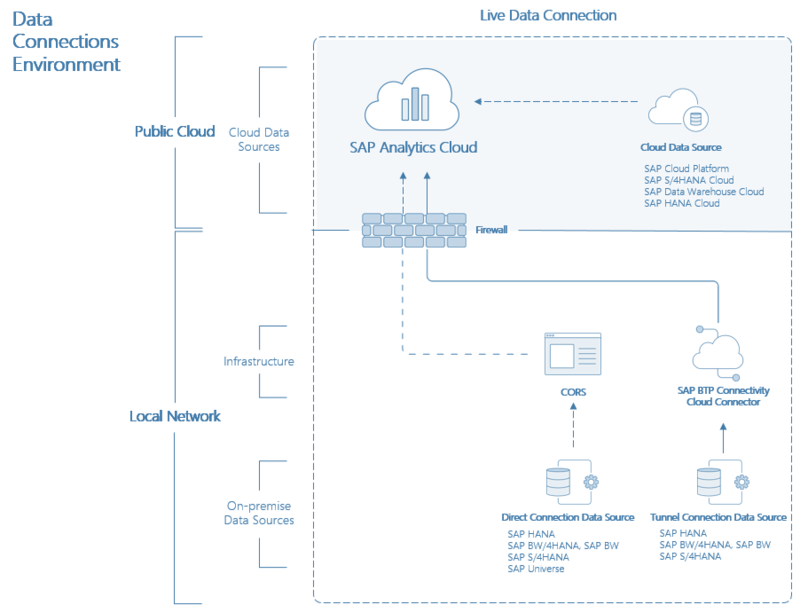 The APOS Live Data Gateway provides live data connectivity from SAP Analytics Cloud to an expanded set of on-premise data sources and cloud data sources. For more information, see Using the APOS Live Data Gateway.